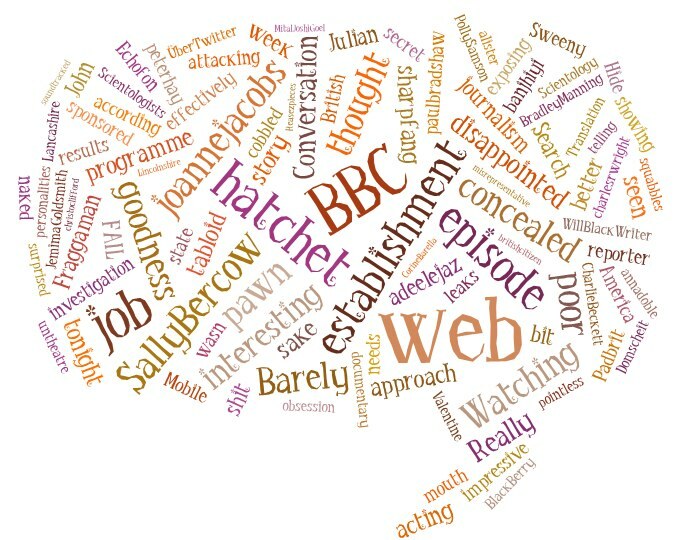 This entry was posted in online journalism and tagged panorama, tagxedo, twitter, Wikileaks, word cloud, wordle on February 14, 2011 by Paul Bradshaw. Tonights vindictive attack on wiki-leaks was a rather petty affair to say the laest.information was based on weak assumptions and some shaky facts at best.I completly understand julian not wanting to appear on a BBC programme as he knows its already bias towards him,However i can clearly see why his deliberate absent may indeed cause further enhanced, negative speculation.I am personaly going to seek futher investigation into all things wiki-leaks and if i may poke my nose in for just one second, i would advise all journalistic types to seek futher in-depth investigation before making any snap judgements based on tonight’s sumwhat uncertain report, lets stick to what we do best, search, enquire, speculate, evaluate and then do it all again for good measure.Thankyou for reading. 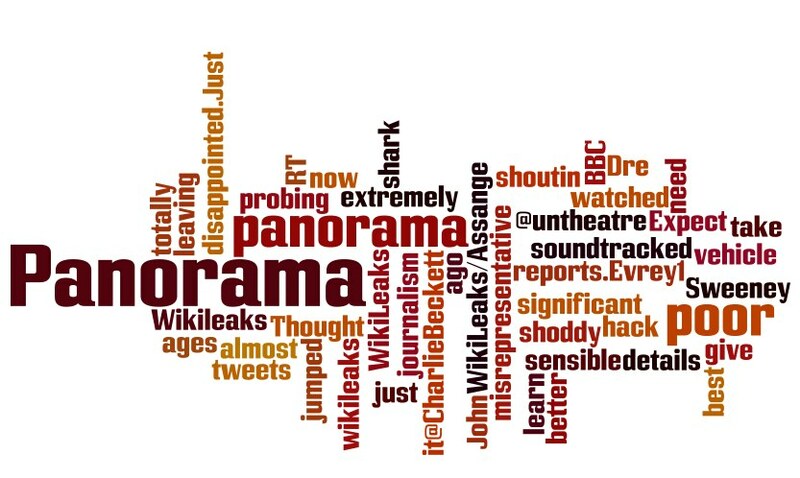 I agree that Panorama on Wikileaks was disappointing to say the least. I have always respected Panorama until tonight. The programme was unfairly weighted against Julian. Julian is one of those rare people that had the guts to stand up for what is right. He needs our support. Those in power have done so much to try to discredit him so that he will lose public support. The Panorama programme tonight did not help. Nevertheless, governments risk many thousands of people taking to the streets in protest in the UK if they keep trying to unfairly discredit him. Totaly agree with the support call you made for assange, hopefully theres alot more of us than the governments spinners. Panorama are very hit and miss, I applauded them for the Scientology stuff even if it was very watered down, they had hours and hours of interviews about human rights abuses and crimes that never made it to air. The women’s lawyer, very poor on Sweeney’s part he didn’t explain one of the women has ties to a US-financed anti-Castro and anti-communist group, how about one of the women deleting social media posts that go against her claims before the spot light hit her “Mr Rudling explained how he had found tweets from one of the alleged victims, Miss A, posted on 15 August – less than 24 hours after the alleged sexual assault. The messages, said to have been deleted on 20 August last year, the day both women made their allegation to police, revealed how she was enjoying Mr Assange’s company. One, sent at 2am, read: “Sitting outside… with the coolest and smartest people, that’s amazing.” It was said to refer to a party which Mr Assange and the alleged victim attended. The whole aura of there is zero threat against Assange or Wikileaks, especially from the U.S.A, I mean really wtf. Interview with the U.S.A government mouth piece guy saying their sources and people have had to go into hiding, ok so where is the proof ? surely if there is any it would have been used to turn the peoples support against Wikileaks. Overall I have to say I fell a sense of disappointment that Sweeney even allowed his piece of weak trash to be aired with him fronting it.